One of my last shoots in 2018 was this epic Red Lodge engagement session. I met Amalia and Simon when we facetimed in November to see if we were a good fit. We were all laughing during the call and I was awkward, it felt right and it was a done deal. These guys are planning their Montana wedding from San Francisco where they live. So while they were in MT for Christmas we took the opportunity to shoot their Red Lodge engagement photos. We started at the candy emporium and immediately they were excited, laughing, and all things that make amazing photos. I just told them to hang out, and they roamed the aisles while picking candy for family. All while looking cute and having that kid in a candy store kind of fun. We made our way up the highway and made a couple stops along the way. For a couple minutes the sun was leaking through the clouds making the snowflakes light up! I was freaking out and I think they were probably just questioning having a cold winter session. 😂 They’d make faces and do the best weird poses, it was awesome! For example I’d say walk together and they’d jump, I’d say embrace and he’d wrap his legs around her. 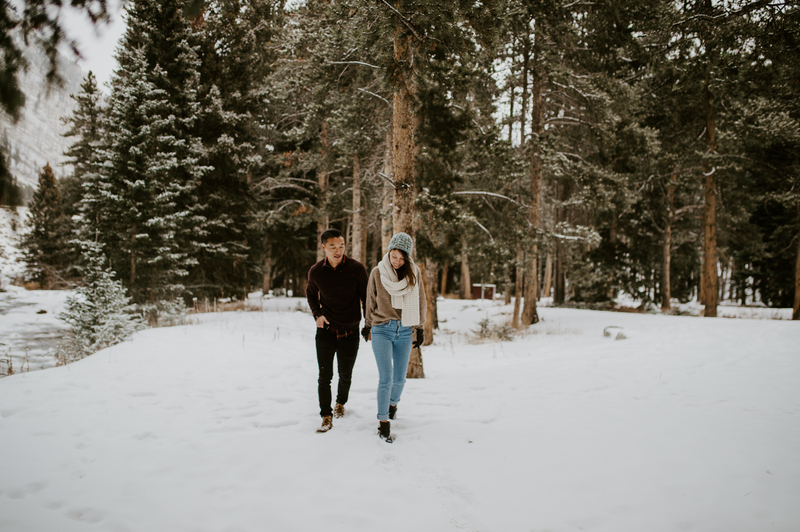 Movement and cuddling is the best way to stay warm on winter shoots, and these two did all that and more. We were out there for like an hour and a half and it was plenty of time to get amazing photos. I learned about how he proposed on a boat, their dog Primo, what they like to do for fun, and all about their wedding plans. Simon’s family lives in Montana and Amalia’s is in Sweden, so I cant wait for when the two families come together to watch these amazing people get married in September.